Hanging art is something of an art in itself. There are rules and tips and advice and stuff that people go by, like “the middle must be so-and-so inches from the ground”. This might work sometimes, but certainly not always. I actually forget what that magical number is! I do know, however, that whenever I’ve tried to follow any of those rules, odds are that the final result will look a little weird. Learn to trust your gut when it comes to balancing out artworks with surrounding aspects of the room. 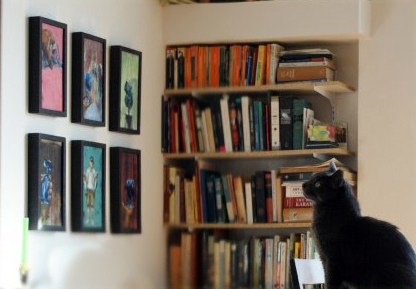 To hang art, you need to take many, many factors into consideration. How high are the walls? How wide is the available space? Is there furniture nearby? How bright is the art, does it contrast with everything else in the room or does it blend in? Is there odd lighting at some time of the day? Is the artwork visually top-heavy? If I hang this tiny painting on a large wall… will it look silly? So many of the answers are based on gut feelings. You need to experiment, try different spots, different pieces in different places, and one day you will learn to trust your gut. Play around with the groupings, if you are so inclined and are so blessed to have so much art. To start you along this path of trusting-your-gut, I will make a few suggestions (besides encouraging you to make many holes in the wall). If you have small work and a large wall, try hanging it off-centre. Think: “Syncopation“. Off-kilter, off-centre… a little high or a little low. Something to make your eye try something a little different with the available space. Art should be something that makes the viewer think and consider, to take pause… so curating a wall of art is a responsibility. It’s a chance to say something, besides What’s The Current Trend. 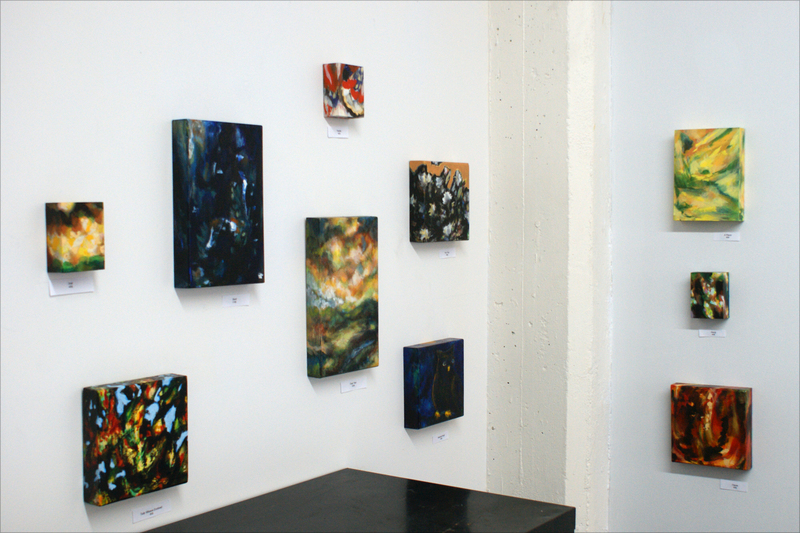 Another option is to display small works in a cluster. Some would stress over frames, sizes… but try to let go of stress. It’s just so much easier this way. You don’t NEED to use a tape measure, string, pencil, etc for a grid. Just try to make it. It’ll be ok. If you have a tall, skinny work to hang in a given space, try it aligned more to the right than in the middle. This works REALLY well if you also have something like a floor-lamp, or free-standing chair that you would like nearby the wall too. If it’s in a foyer, it is useful to have a wall to lean on sometimes, or a place to temporarily leave luggage or the vacuum without fear. We do need to think about our practical lives, not just our aesthetic ones. 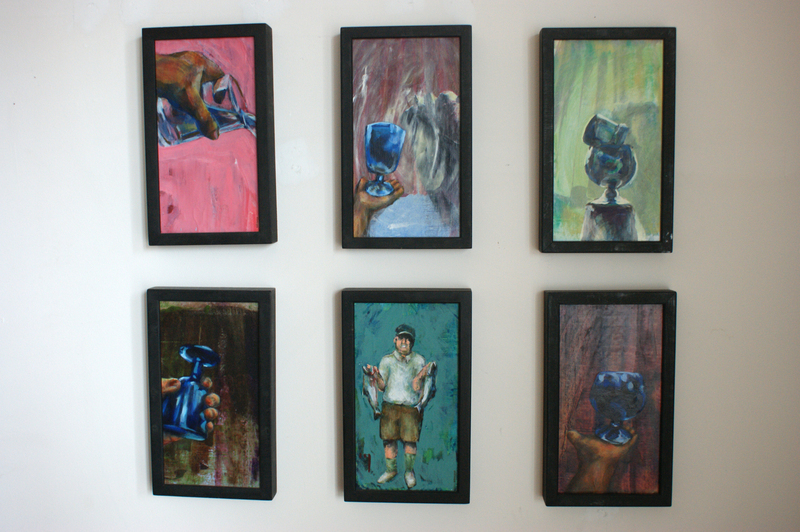 Hanging smaller-scale paintings is not a science, it is a simple art. I think that having a bit of paint in the current wall-colour of your home might be useful. So is having a little bit of spackle (or Dap or whatever, wall-goo) and a spatula. I cannot emphasise enough: Please Try And Lose The Fear of changing your artworks around. Honestly, once you’ve got the general placement for a piece of art, you can start nailing. Try to shoot “low”. 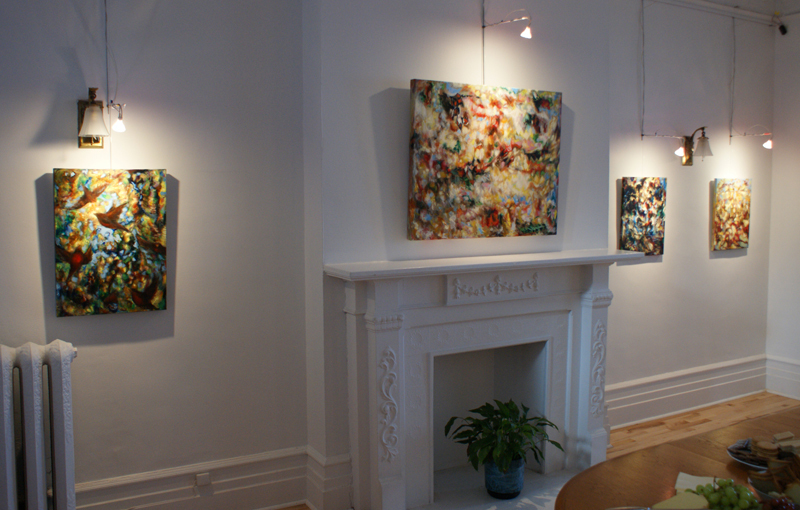 Then, if it turns out that it is too low indeed, the artwork will cover any stray holes from earlier hanging-attempts. You can fill in the holes, dry, sand, paint over… or don’t. It depends on you. If you will be annoyed by knowing it’s not perfect wall underneath your art, then fix it up. Or follow the Natasha Way, and don’t bother! It’s much more fun to make puff-pastry than to perfect a wall that no-one will see. Trust your gut, fiddle around with placement and height, so that it feels "right" in the room. In general, in general, you can look at the visual centre of a piece of art… and make that at “about” eye-level, or slightly lower. Really, it goes against all my experience and instincts to give a rule-of-thumb about hanging art. Now, what is important to take note of, is that the “visual centre” is rarely ever the physical centre of a painting. It’s normally about one-third of the distance down from the top of the work. That’s just the comfortable compositional ratio, what normally happens in most works. Ok, enough of these technicalities. I don’t like making rules about this sort of thing. Did you sense that? Yep, listen to your gut!! !